Uplands (2010) & Between (2012-) from the Debatable Lands project. Leonard Jason (2013) “Principles of Social Change” Oxford University Press. I have learned from my friend Mona Smith that we should begin any enterprise by acknowledging where we are, by placing ourselves. This simple but profound act of re-membering can also remind us of the invisible contexts that inform the incontestable fact that – like the sunlight that falls on the floor in the room in which I write – we are here, in this particular place, with these particular beings – human and otherwise – at this particular time. This act of remembrance helps us understand, for example, the intersection of natural phenomena, the possibilities of hospitality in its widest sense, and the specific local politics of place. Let me take as an example something made clear by Mona, when a group of people were meeting in Minneapolis St Paul. She reminded us that it is important to remember that the land that city is build on is the sacred heartland of the Dakota people, a place were two rivers met, both a physical site and the enactment of Bdote – a word we might translate as ‘confluence’. But Bdote means something more inclusive than ‘confluence’ in simply a physical sense. It speaks an in-between-states place, one that gathers, that makes possible the flowing together of a multitude of different energies, of something close to what the philosopher Martin Heidegger calls the ‘worlding of the world’. It may be that the work (verb) of what we call art is that it reminds us to pay attention to this worlding, to Bdote. Both this text and the exhibition to which it relates are the result of both David Smith and myself attending A Dakota Place. 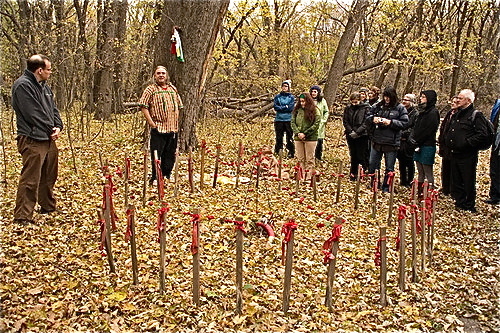 This was a gathering held in the autumn of 2012 and guided by Mona Smith, a Dakota interdisciplinary media artist, with participation from other Dakota people. This event, and a related visit to sites important to the Dakota people, focused on bringing together artists, activists, parks and city planners, students, and Dakota elders, to exchange with and learn from one another. The initial event was held at the Mill City Museum, where Smith has a permanently installed courtyard piece called “Presence”. This celebrates the voices and stories of Dakota people who still live in a society that has by and large neglected to come to terms with US-Dakota relations. 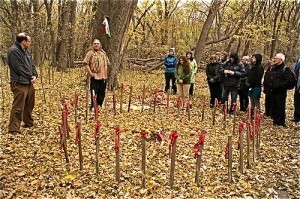 Recitation of Dakota history at a memorial to the former concentration camp in which Dakota people were held, located below Fort Snelling. Drying up / running out? Trackings: Don McCullin, ‘Roland the Headless Thompson Gunner’, and the twilight of landscape? Brief Update: a major Ken Kiff Exhibition?